The South Korean Won (KRW) has stabilised in the first quarter of 2016, in line with general weakness of the US Dollar. The currency rallied to its strongest position in six months in April (Figure 1), with a stabilisation in financial markets in China, South Korea’s largest trading partner, providing renewed support for the currency. The Won had previously plunged to a six year low in February, with South Korea’s dependence on demand from China leaving the currency particularly vulnerable to the Yuan’s devaluation and sharp economic slowdown. A heavy reliance on demand from China for 25% of overall international trade caused exports to fall in every month last year, falling 8.1% on a year previous in March. This was particularly bad news for the South Korean economy, considering exports account for around half of overall gross domestic product. The South Korean economy subsequently slowed in the first three months of this year, growing by 2.7% on a year previous (Figure 2). Private consumption declined by 1.2% annualised, while manufacturing and industrial production both remain weak, having declined throughout much of 2015. The Bank of Korea (BoK) cut its 2016 growth forecast in January to just 2.7%. Inflation has continued to show some encouraging signs of improvement, albeit falling in March and still remaining stubbornly below the central bank’s new 2% target. 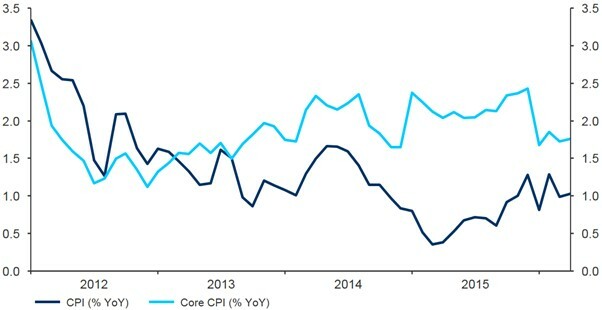 Headline consumer prices grew by 1% (Figure 3), although are expected to remain ‘considerably short’ of the target level in the near term, according to the Bank of Korea. The Bank of Korea brought its monetary easing cycle to an end last year, holding its interest rate constant at its record low 1.5% in April for the tenth straight month. However, weak inflation could force the central bank to cut its interest rate again in the coming months. South Korea’s position as a net importer of oil, and the recent plunge in global oil prices, has provided a boost to the balance of trade. The country’s trade balance almost reached a record high surplus in March. The current account also continues to register a healthy surplus at over 6% of GDP, one of the largest in Asia. The central bank has continued to accumulate a vast hoard of foreign exchange reserves, equivalent of around ten months’ worth of import cover. South Korea’s policymakers recently verbally intervened in the currency markets, claiming they would take necessary action to protect the Won. However, given the Bank of Korea’s focus on Chinese economic conditions, we think that authorities are unlikely to permit any significant KRW appreciation against the Chinese Yuan. 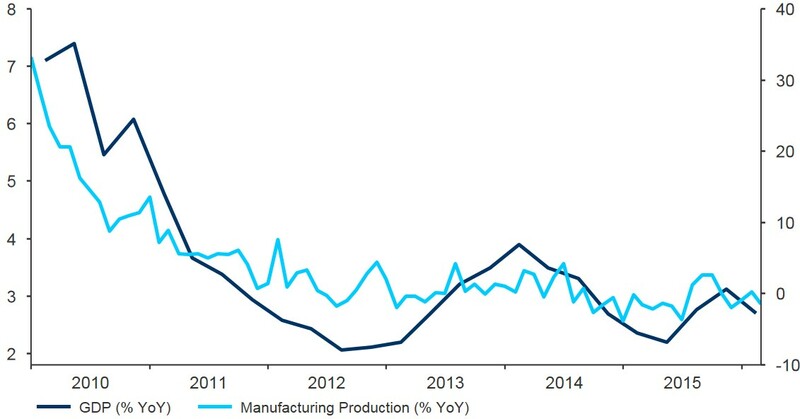 We think that the BoK will also be comfortable with a weaker Won in order to boost inflation and increase exports. What does the future hold for KRW? Weak external demand, particularly from China, and the possibility of another interest rate cut in South Korea, should cause the Won’s downward trend against the US Dollar to recommence, particularly amid gradually increasing interest rates in the US. A slow depreciation of KRW against the US Dollar and the large scale easing measures launched by the European Central Bank in the Eurozone should, in our view, ensure a gradual long-term strengthening of the Won against the Euro during the remainder of this year and throughout 2017. Get in touch to discuss your South Korean Won exposure.